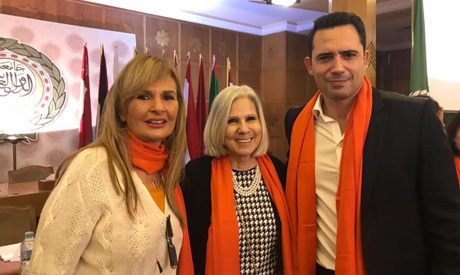 Egyptian actress Yousra participated in the opening ceremony of the UN/Arab League campaign “Orange the World: #Hear Me Too; End Violence against Women and Girls” in Cairo on 25 November. The opening ceremony was held at the Arab League’s general secretariat. Tunisian movie star Dhafer L'Abidine was also in attendance, along with high-level figures from the Arab League. The 16-day campaign runs from 25 November to 10 December. The United Nations have, since 1981, designated 25 November as the International Day for the Elimination of Violence against Women. The date was selected to honour the Mirabal sisters, three female activists from the Dominican Republic who were brutally murdered in 1960 on the orders of the government. In 1993, the United Nations General Assembly adopted the Declaration on the Elimination of Violence against Women, then, and in 2000, the General Assembly declared 25 November as the official day for the Elimination of Violence against Women. Yousra was appointed as a Goodwill Ambassador by the United Nations Development Programme in 2006, and as UNAIDS Regional Goodwill Ambassador in 2016. She has had a starred career in Egyptian film and television, working with big names like director Youssef Chahine.